Taco Tuesdays around the LBC usually means let's go get some dollar Tacos at one of our local favorites Hole Mole. 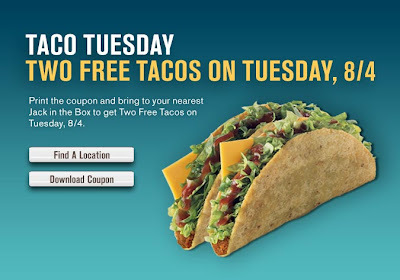 Well, if two dollars is too steep for you, then too bad....just kidding, Jack in the Box is giving away 2 Free Tacos on 8/4. Now we're not sure if you're going to have to stand in a Disneyland type line to get yourself these "Snack-in-a-Crack" free-bees, but my guess is that there might be a few people trying to score themselves some of these bad boys. Anyway, I know, you just want to know about the free stuff, so take a look below for details, and remember who loves you, (shoot, I'm not sure I even know you), well, much love to you anyway.